Retail sales gained ground in July, stemming a three-month stretch of consecutive declines. Higher gasoline prices modestly contributed to the sales increase, but deep discounting to spur back-to-school shopping likely provided the impetus for much of the improvement. 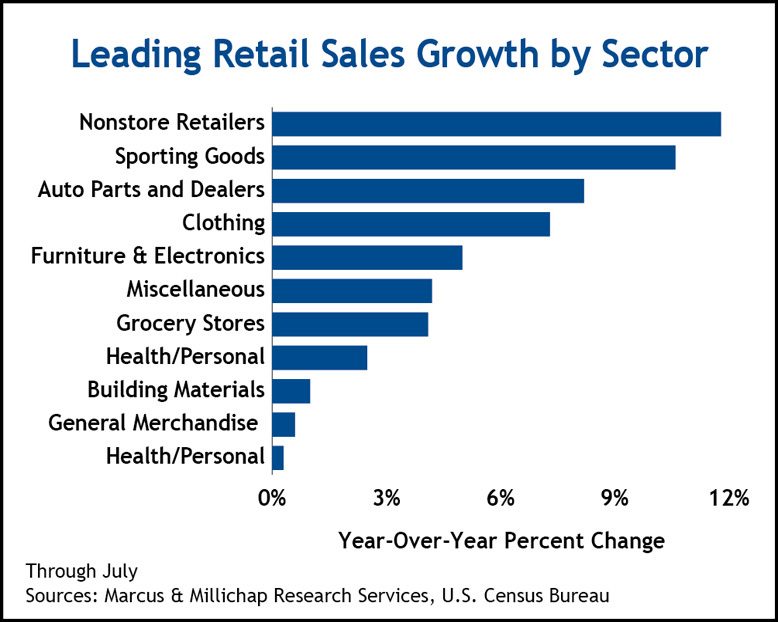 In addition, several retail categories that underperformed in June staged notable gains in July, including building materials, and sporting goods, music and book stores. The resurgence in retail sales beat expectations despite a tepid labor market and relatively flat income growth, which lent little foundational support for increased consumption. In addition, July’s improved job growth offers another optimistic data point, but most economic metrics remain below the first quarter. July retail sales advanced 0.8 percent over the downwardly revised June figure to achieve an annual gain of and 4.1 percent. Core retail sales, excluding autos and gasoline, increased 0.9 percent and remains 4.2 percent higher on an annualized basis. Segments leading the gains include sporting goods, book and music stores and non-store retailers, which posted 1.6 and 1.5 percent growth, respectively. Furniture and home furnishings stores and health and personal care stores, both marked monthly advancements of 1.1 percent. Non-store retailers and sporting goods, book and music stores had the strongest annualized gains, posting 11.8 and 10.6 percent, respectively. However, department stores and electronics and appliance stores reported declining revenues on an annualized basis of -1.0 and -0.8 percent, respectively. A mindset of economic and political uncertainty will prevail through the elections, as small and large businesses defer decisions of real consequence until more political and financial clarity is achieved. A few positives have re-emerged, however, as evidenced by the increase in e-commerce sales, which rose 3.3 percent over last quarter, representing the 14th consecutive quarterly increase in online sales. Internet sales measure 15.3 percent higher than last year. In addition, the Conference Board’s index of leading indicators, climbed for the fourth time in six months, aided by improving jobless claims and rising building permits. Industrial production currently lacks the momentum to induce a business-led economic expansion, but remains strong enough for the time being to keep the U.S. from slipping into recession. The deceleration in industrial production and other economic factors that influence demand for industrial properties present heightened risks for the sector’s performance for the remainder of the year. Thus far, however, distribution, warehouse and manufacturing space exhibit impressive leasing and rent growth momentum, aided by low levels of supply. Vacancy is forecast to tighten by 50 basis points to 11 percent by year end. The long-run strength of e-commerce trends could contribute significant demand for centrally located distribution and warehouse facilities. Net new demand for retail space remains limited, and the decline in national vacancy owes more to the dearth of new supply, expected to total 32 million square feet this year. Pending bi-partisan legislation to tax online retailers at a rate comparable to bricks-and-mortar retailers could effectively eliminate the 5 to 10 percent pricing advantage currently held by online merchants. Whether that results in stronger demand for retail space remains a question, but clearly it will help level the playing field. Forward projections call for a further decline in vacancy to 9.4 percent by year end and effective rent growth by year end of 1.3 percent. This entry was written by marcusmillichap, posted on August 17, 2012 at 11:41 pm, filed under Research and tagged Commercial Real Estate, Retail Sales. Bookmark the permalink. Follow any comments here with the RSS feed for this post. Trackbacks are closed, but you can post a comment. Commercial real estate spaces are starting to fill up more and more, although slowly. The economy is slower turning back around and that will make a big impact on the entire economy.